This fresh, healthy, and delicious vegetable pasta dish from Chef Rocco DiSpirito showcases his Italian cooking roots. He says, “Italians are champions of simple, classically delicious ways of using fresh tomatoes. And they should be; they’ve been cultivating them for hundreds of years. 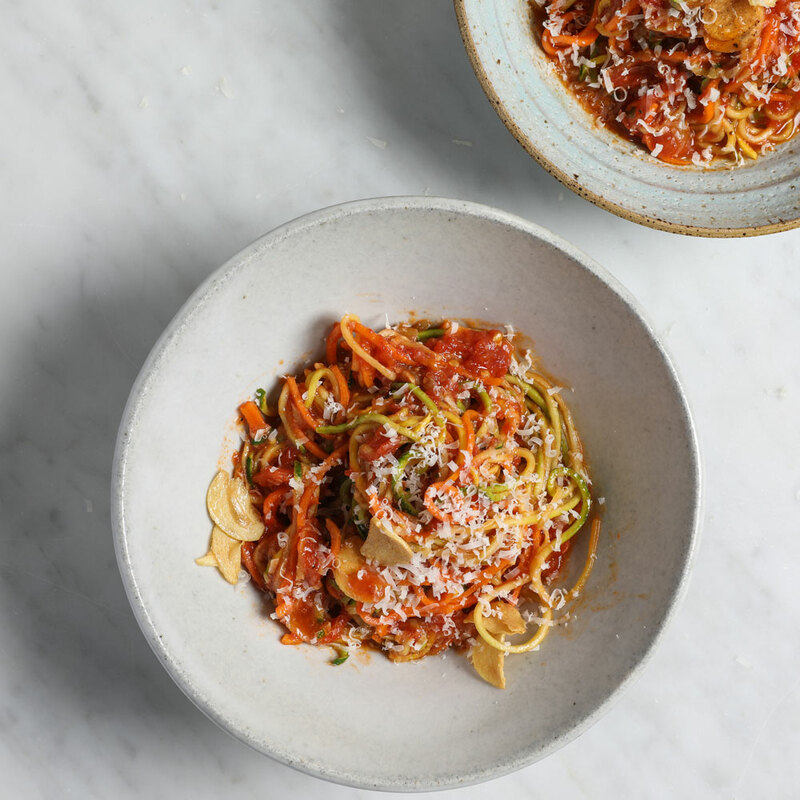 One of the many basic ways they prepare garden-fresh tomatoes is in a pomodoro sauce made with basil and garlic tossed with pasta (or in this case, spiralized vegetables).” Recipe is Reprinted with permission from Rocco's Healthy + Delicious by Harper Collins Publishers. Cut the ends off of the zucchini, squash, and carrots. Using the instructions with your spiralizer, cut the vegetables into long angel hair-shaped pieces. In a bowl, mix the squash and zucchini noodles together and lightly salt them. Set aside to drain. Place the carrots on a microwave-safe plate and cover with plastic wrap. Microwave until softened, about 4 minutes. You will need to do this in two batches. To make the pomodoro sauce: Heat the olive oil in a large sauté pan over medium heat. Add the garlic and cook until soft. Add the chile flakes and half of the basil and cook until fragrant, about 3 minutes. Add the tomatoes and cook until softened and beginning to fall apart, about 10 minutes. Drain the liquid from the squash and zucchini. Place in a large bowl. Add the carrots and mix together. Place a portion of the pasta on a microwave-safe plate and heat for 30 seconds to warm through. Repeat for all the portions. Top with the pomodoro sauce, the remaining basil, and the Parmesan.